The ancient Healing Service is this Wednesday, October 24th at 7 p.m. We encourage everyone to bring family, friends & acquaintances to this powerful service introduced by Father Sid. Festival of Hope 2012 is being held at Annunciation parish in Homer Glen, IL next weekend from October 27-28. There are many services and sessions scheduled. The itinerary is available in St. Mary’s Hall. 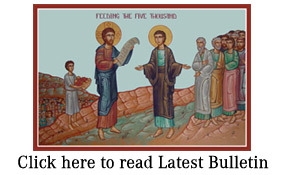 Saturday evening vigil Divine Liturgies for Sundaywill resume in November. The pantry has been in higher demand, partially due to the change of weather. Currently our pantry needs canned vegetables, fruits, and beans, pasta & sauce, soup, oatmeal, rice, apple sauce, hot chocolate, fruit juice, toothpaste & tooth brushes. We have Marsh scrip cards to buy these items if you shop there. There are freshly-baked rolls, kolachy, pumpkin log and biscotti available. We have books, icons, bracelets, thank you cards and scrip (merchandise) cards too. We want to thank Al Zetsel and two of his grandchildren, Dominic and Claire. Including Belinda D we had great workers this week. Thank you.